Get Bizzy Living: Healthy 4th of July! Tomorrow is the 4th of July, which means bbqs, pools, and a whole lotta love for our nation. I've found some great links on ways to ensure that you have your best (and healthiest!) Independence Day yet. Enjoy! Jonesing for some American eats? Eat Better America has compiled a great website on healthy 4th of July food here. 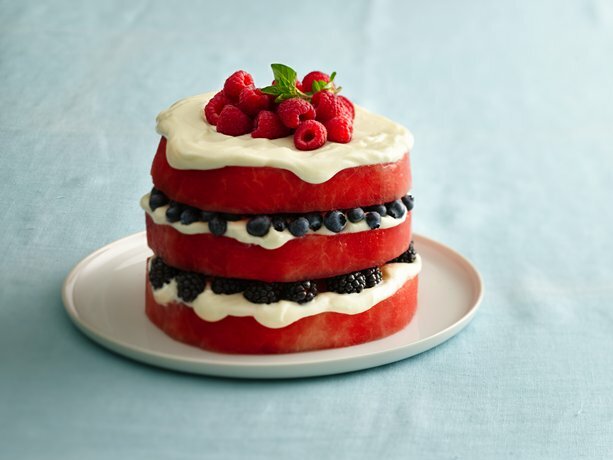 I love the idea of their Red, White and Blue Fruit Cake! Give the earth some patriotic love by following these green Fourth of July tips. 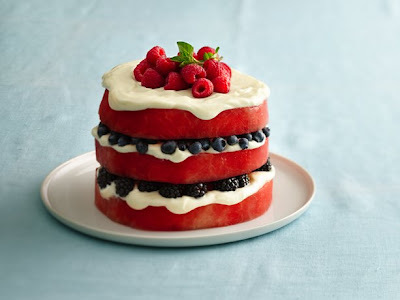 Keep your picnic food themed to the day with this great compilation of red, white, and blue recipes from Fitsugar. Decorate your Fourth of July party with these adorable craft ideas from Apartment Therapy. Make the day a safe one by following these guidelines from MedicineNet.com. Whip up some of these frozen banana popsicles and enjoy some banana benefits (and chocolate, too)! Bump down your calorie intake by revamping classic Fourth of July BBQ food by following these tips. Hope you enjoy, and have a WONDERFUL Independence Day! America! The red, white, and blue fruit cake is my favorite so far, but I also loved the idea of home-made pita chips and fizzy water with fresh fruit! Thanks, Bizzy!